Friday, Oct. 21 – 4 p.m. – The Moose Creek Fire north of Palmer along the Glenn Highway is now 100 percent contained, according to the Alaska Division of Forestry. Alaska Division of Forestry firefighters toured the fire perimeter on Friday morning and declared the 303-acre fire fully contained, according to Incident Commander Phil Blydenburgh. The Division of Forestry will continue to monitor the fire to ensure no hot spots along the perimeter flare up but that is not likely given the fact that about 2 inches of snow fell on the fire Friday morning, Blydenburgh said. 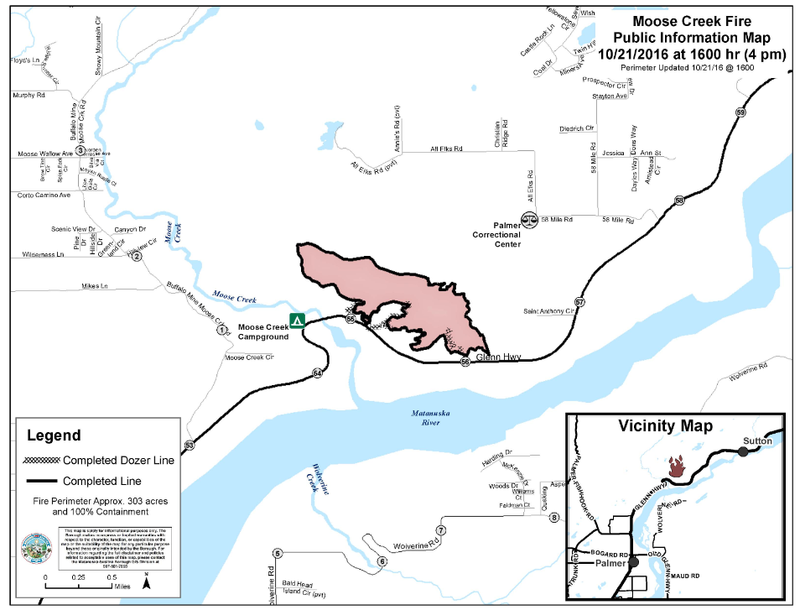 The Moose Creek Fire started early on October 15 as the result of an escaped debris burn and spread quickly due to high winds. The fire was already at 100 acres by the time the Division of Forestry could mount a unified response and high winds the first three days of the fire had firefighters scrambling to keep up with it. At one point, the fire burned to within about 75 feet of the Glenn Highway but firefighters were able to keep it in check and prevent it from crossing the highway. No structures were damaged by the fire. Given the late timing of the fire and limited resources available, State Forestry received assistance from multiple agencies and organizations to help contain the fire, including Alaska Air National Guard, Alaska State Troopers, BLM Alaska Fire Service, Matanuska-Susitna Borough, National Park Service, Tanana Chiefs Conference, U.S. Fish and Wildlife Service and U.S. Forest Service. Mat-Su Valley fire departments involved in the suppression effort included the Butte Fire Department, Houston Volunteer Fire Department, Palmer Fire & Rescue, Sutton Fire & Rescue and West Lakes Fire Department. In addition, State Forestry would like to thank Quality Asphalt & Paving and Northern Pioneer Helicopters for their help.